Crews had to construct a new road through native, undeveloped ground. The Daniel K. Inouye Highway (DKI), also known as Saddle Road, is the most direct cross-island route between east and west Hawaii Island.People use the road for business travel, transport of goods and services, tourism, recreation, shopping and daily commuting. Taking this route saves 30 to 45 minutes in drive time as compared to any other alternative route. In addition to being a cross-island route, Saddle Road provides the only paved access to the U.S. Department of the Army’s Pohakuloa Training Area, Mauna Kea State Park, and the Mauna Kea and Mauna Loa observatories. 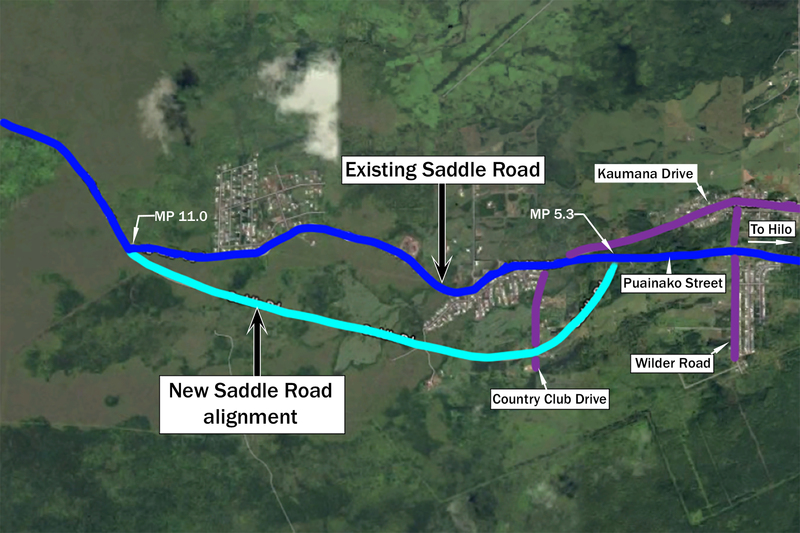 The Central Federal Lands Highway Division of the Federal Highway Administration, in cooperation with the Hawaii Department of Transportation, developed a project to construct a new realigned 6-mile section of Saddle Road between mileposts 5.7 and 11.7. The roadway was upgraded to a 52-ft paved width and authorized for a straighter alignment. There are two 12-ft-wide travel lanes with 8-ft-wide shoulder lanes for passing. A 12-ft-wide climbing lane for slower and larger vehicles also was provided for most of the length of the project. Hawaii Asphalt Paving Industry member Road and Highway Builders LLC (RHB) started work in March 2016 and completed the project in September 2017. The project cost came in at $57 million. The Saddle Road project culminates years of improvements to the cross-island highway that have spanned 48 miles and cost $316.5 million overall. The road was originally built in 1942 as a one-lane thoroughfare to connect military training facilities, thus its outdatedness was apparent. The realignment of Saddle Road presented challenges to crews, notably environmental concerns. Paving of the new road required a 5-in.-thick asphalt pavement. This thickness was accomplished in two lifts. A Marshall mix, utilizing a ¾-in. nominal aggregate and totaling 36,000 tons, was installed as the bottom 3-in.-thick lift, and a SuperPave mix, utilizing a ½-in. nominal aggregate and totaling 24,000 tons, was installed as a 2-in.-thick surface course. The 52-ft-wide paved section of road was accomplished with pull widths of 20 ft, 12 ft and 20 ft for most of the project. Material for the project was readily available. A PG 64-22 asphalt binder, as required in the project specifications, was supplied by two local providers, Asphalt Hawaii and PAR Hawaii, located on the neighboring island of Oahu. RHB was familiar with the procedure to procure and transport binder from Oahu to Hawaii Island, since they had done so on several previous projects. The aggregate used to produce the asphalt pavement was crushed in the Pohakuloa Training Area (PTA) quarry. A portable plant, also located in PTA, was likewise brought to the island for this project. The PTA is located about 30 miles away from the project at milepost 38. The 30-mile distance from the plant site to the project sometimes presented a challenge of securing an adequate number of trucks to meet the desired paving production. Scheduling of the trucks was done to minimize any adverse effects on the travelling public, due to the crucial nature of the corridor and the limited ability of project planners to assign alternate routes during the project term. Asphalt delivery and paving on the project was handled by belly dumps, a Roadtec Shuttle Buggy and a Cat AP1000E paver. The number of belly dumps used was based on a given day’s production and the haul cycle to the location on which paving was taking place along the alignment. However, on several occasions the number of belly dumps used was limited by the availability of trucks on the island to pull the trailers. The use of belly dump trucks is something rarely seen in Hawaii; local contractors generally do not have the required equipment. Most of the roads in Hawaii have intersections and driveways at frequent intervals, making it impractical to use a belly dump that leaves a windrow of asphalt pavement on the road. For this project, however, there were mainly minor access roads and no driveways, making the use of belly dumps ideal. As RHB is a Nevada-based company, it had the resources—in terms of both equipment and experience—to use belly dumps in their paving operations. Crews took advantage of their resources and used belly dumps to increase production and improve smoothness. A minimum compaction of 91% of the maximum specific gravity was specified in the project contract. The rolling pattern employed was not necessarily static and was modified somewhat continuously throughout the project based on location, grade and other mitigating factors to meet and/or exceed the compaction specification. Two Cat double steel-drum rollers and one Dynapac pneumatic rubber tire roller were used for the duration of the project, and proved to be more than adequate. Compaction exceeded the project specs along the entire length of the project limits. The ultimate result of RHB’s efforts was new and smooth pavement for the commuting public. The pavement smoothness exceeded expectations. Due to their excellent workmanship, there was no grinding or corrective actions required, and at project’s end no penalties were levied. The new Saddle Road has 12-ft. travel lanes and 8-ft shoulders. The project faced several challenges, including Rapid ‘O–hi’a Death, paving over ash, paving on steep grades and unpredictable weather conditions. A particularly unique challenge for the project was preventing the spread of the Rapid ‘O–hi’a Death (ROD) disease. ROD is caused by two strains of the fungus Ceratocystis, which attacks the vascular system of a tree and can be easily spread by contact with infected trees. ‘O–hi’a trees cover more than 1 million acres statewide, making it perhaps the most important tree species in Hawaii. Based on recent and ongoing aerial surveys in 2017, about 75,000 acres of ‘O–hi’a forest currently show symptoms of ROD disease on Hawaii Island. Construction of the roadway included demolition of many ‘O–hi’a trees, as ROD was believed to be on the project site. Precautions were taken to minimize the chance of the disease-causing fungus leaving the site. All ‘O–hi’a trees removed in the demolition phase of the project remained on-site. Removed trees within the 120-acre project site were ground and placed on embankments as a best management practice for storm water. In addition, all vehicle tires and undercarriages were washed regularly to remove any fungus. Also, all personnel made sure that their gear was cleaned before leaving the project site. Soil was brushed off of tools, and shoes were sprayed with a 70% rubbing alcohol solution. A further challenge was that a major portion of the project was constructed over existing ash. The presence of ash in the subgrade would have resulted in an unstable subgrade. To minimize the effects of the existing ash, platforms were constructed by overexcavating the ash, and placing geogrid and fabric on the overexcavated area, after which 6-in. minus material was then placed in 6-in. lifts and compacted. Care had to be taken to follow proper construction techniques to minimize the ash contaminating the platform. If a platform became contaminated, it was removed and the process started again. Paving on steep grades can oftentimes be difficult, and the entire Saddle Road project was on a slope. Approximately 75% of the 6-mile project site is steeper than 5% with the steepest grade being 7.2%. RHB decided to pave in the downhill direction, which was their preference, after a careful evaluation of the site. What’s more, paving in the downhill direction also meant paving in the opposite direction from the project’s asphalt plant. Paving away from your source minimizes possible damage from loaded trucks turning on the subgrade, base and fresh asphalt paving. 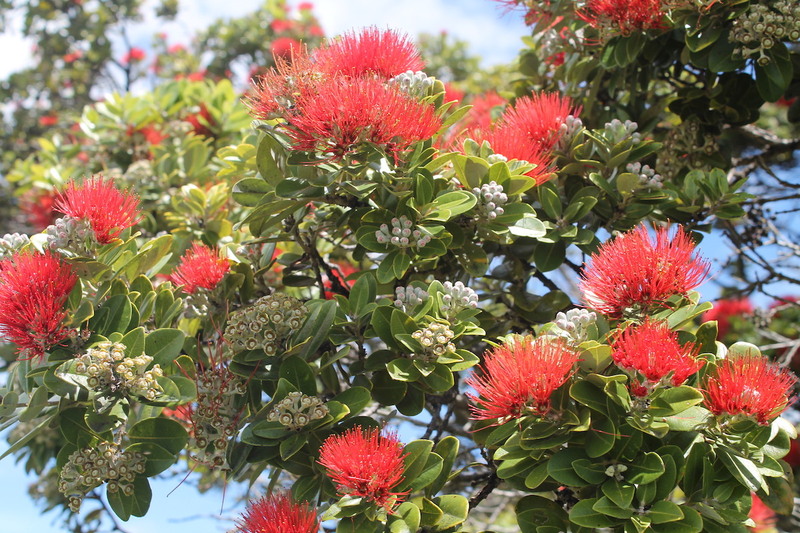 ‘O–hi’a trees cover more than 1 million acres statewide, making it perhaps the most important tree species in Hawaii. Preventing the spread of the Rapid ‘O–hi’a Death disease was a unique challenge for the Saddle Road project. According to RHB, it is much easier to pave downhill in most respects, because it decreases the chances of equipment not being able to pull the hill or simply getting stuck. Also, unloading trucks and paving downhill with rubber tire machines decreases the chances of the equipment spinning its tires on the road base or new pavement. Unpredictable rainfall events also were something the contractor needed to account for in its planning and scheduling of paving work. RHB monitored weather forecasts to plan their operations. Complete rain-out days were commonplace, occurring once a week on average. Sometimes earlier morning rains delayed the start of paving for the day. There also were multiple occasions when paving got started, then had to be stopped because of rain. Such lulls in productivity had to be accounted for on the fly, and crews thus dug in all the harder to make up for lost time. There also were incidents when it rained only for brief periods—passing showers that were relatively mild and could be, to some degree, anticipated—and sometimes RHB was able to shut operations down before it rained. If it rained unexpectedly, options were left open on the project to pave in different locations for the asphalt that had already left the plant. Once weather reports and visual inspection of the weather indicated there would be clear skies, crews would continue to pave. The largest concern regarding the weather was the chance of rain occurring above the immediate area being paved, which would cause unexpected flooding of the work area. Care therefore had to be taken to not only monitor the area that was being paved, but other areas that had an impact on paving operations. The mixture of weather monitoring and careful scheduling and paving practice thankfully precluded any such event from hampering progress. Crews employed belly dumps such as this one. On Oct. 10, 2017, a dedication ceremony occurred for the opening of the DKI Highway East Side construction project. The completion of the East Side project is a significant milestone by safely connecting the communities of East and West Hawaii. Gov. David Ige, Mayor Harry Kim, Hawaii Sen. Mazie Hirono and officials from the Federal Highway Administration were on hand to see the island draw together as it never had before. Click here for the article as it appears on the Road & Bridges magazine website.